Photograph of 174-foot-long main span on March 10, 2018, prior to placement on south pier and north pylon pier, looking west. Labels showing diagonal member 11 and vertical member 12 added by NTSB. Washington, D.C. — An investigative update issued by the National Transportation Safety Board (NTSB) on Nov. 15 about its ongoing investigation of the fatal, FIU pedestrian bridge collapse in Miami, says errors were made in the design of the 174-foot span and cracking observed prior to the collapse is consistent with those errors. 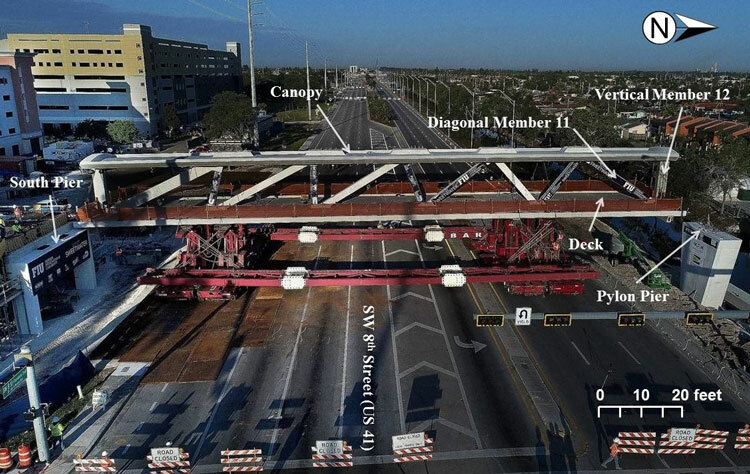 The update states errors made were in the design of the northernmost nodal region of the span where two truss members were connected to the bridge deck. The design errors resulted in an overestimation of the capacity (resistance) of a critical section through the node, and, an apparent underestimation of the demand (load) on that section.